CEB runs a year-long internship program open to UCI undergraduates of all majors. UCI student interns receive academic credit through Bio Sci 197: CEB Internship (Dr. Huxman is listed as the Instructor of Record) and may additionally receive credit through Bio Sci 199, ESS 198, or ESS 199. Prerequisite: Must have taken Bio Sci 194s by fall enrollment (1-unit, online Safety & Ethics course). Applications for the 2019-2020 school year are now open! To apply, submit a completed application and one letter of recommendation to Jennifer Long by May 20, 2019. CEB interns participate in ecological research projects related to conservation and restoration in Orange County. 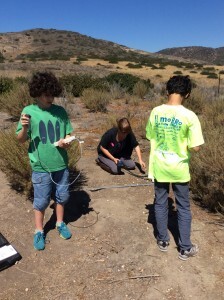 Interns work directly with local land managers and UCI scientists. Projects are conducted in a combination of field, lab, and greenhouse settings. The program consists of a full year of 199 units in addition to at least one unit of Bio Sci 197 (the CEB Internship course). Training and cohort-building activities during the Fall Quarter develop research skills such as plant identification, vegetation sampling methods, and operation of specialized equipment. During Winter and Spring Quarters, interns focus on collecting data in the field. Interns attend weekly meetings throughout the internship to discuss relevant literature, data analysis, and other topics related to our research projects. Interns who participate in the program for more than one year have the opportunity to develop their own, independent projects related to our ongoing research program.